What is happening in Anniedale-Tynehead & why it matters. Over the years, various groups of developers have attempted to assemble enough land to justify the extraordinary cost of servicing the Anniedale-Tynehead neighbourhood. The development group currently working on this has made it much further in the process than their predecessors. Their progress includes submitting engineering applications for servicing, many new transactions, higher land purchase prices than ever before and much more. An engineering application has been submitted by a development group that controls most of the properties highlighted in green on the above map. These applications are for infrastructure upgrades that would provide the main components of the sanitary sewer and water services required to service the entire Anniedale-Tynehead neighbourhood. It is this servicing that has historically held up development in the neighbourhood. The development group spearheading the application also intends to provide drainage services for their land and this work should provide services for many neighbouring properties within the same catchment areas. This development group proposes to front-end the cost of this work and establish a cost sharing mechanism which will require all future developers to share in the cost. The applicant is also proposing a collection of significant modifications to the current land use plan; however, a neighbourhood plan amendment has yet to formally be submitted. The modifications include changes to density, alterations to the character and density of the commercial area on 96 Avenue, and more. The changes are extensive enough that the City would be required to conduct a large-scale review of the land use plan to ensure supporting infrastructure (roads, etc.) would still align with the revised land use plan. It’s unclear, at this time, when we may receive additional clarity on these potential changes and how this may impact the timeline to development, but a large scale review would likely delay development. Many of the development land purchases that have taken place in Anniedale-Tynehead over the past year occurred off-market (not on MLS) and have 12-18 month completions. As a result, the transaction information has not become public for many of these purchases. However, there are a few transactions that have become public, which provide some insight into sale prices of development land. The location of the properties that transacted can also be found on the above map. 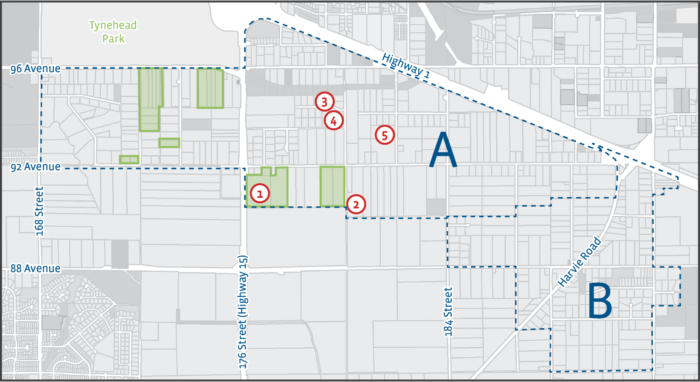 Whether a property is located in the area of Anniedale-Tynehead that has a land use plan (Area A on the above maps), or in the future development area that has yet to be assigned land use designations (Area B on the above maps), construction of the required services (sanitary, water, etc.) shortens the timeline to development for all properties benefiting from those services. Similarly, the proposed changes to the land use designations outlined in the existing Neighbourhood Concept Plan could alter the allowable densities or the type of homes to be built on some properties. Either of these events could have a big impact on the value of properties in the area. If you have questions, we’re happy to share what we know about the future of the neighbourhood. Please don’t hesitate to contact Mike Harrison.